Well....where do I start? I give ProActiv 4 out of 5 stars. Overall, this sentence sums up my thoughts: "ProActiv is effective for controlling (not curing) mild to moderate acne ALTHOUGH it is overpriced, gimicky, and a relatively standard treatment for acne." I will elaborate on this thought below, so please continue on if you would like more details! So you have seen the cheesy, overly positive infomercials and honestly, they are just ridiculous. Literally, as I am writing this, a ProActiv commercial comes on and now Justin Beiber is their newest spokesperson! Am I really supposed to believe that Justin Beiber uses this stuff? Not to mention Jessica Simpson, Avril Lavigne, Katy Perry, I mean isn't it just OBVIOUS that they use celebrities as sales people? Let's be honest, celebrities get Accutane, that way acne is never a problem...period. More on Accutane later. The fact of the matter is that ProActiv is more about marketing than skin care. Yes, the 3-step system is effective, but truly there isn't anything all that special about it! The system is based off of Benzoyl Peroxide, a topical antibacterial agent that kills the acne-causing bacteria in the pore. There are many, many products that utilize benzoyl peroxide that are equally as effective, less expensive, and readily available (unlike ProActiv). The system is accessorized by specialty treatments to enhance acne-prone skin such as masks, BHA exfoliants, and oil absorbing items that warrant a try. What ProActiv DOES DO right, is make it easy to follow a decent skin care routine with a step system that is available as a package. 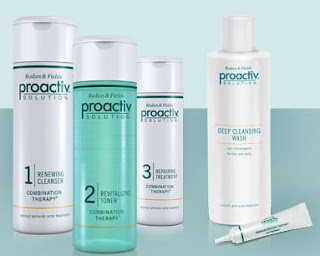 The stand out products by ProActiv include the "Repairing Treatment" (benzoyl peroxide) and "Clarifying Night Cream" (1% BHA) for their superb formulations. Forget their new "Medicated Cleansing Bar", all bar soaps are irritating to skin and this one in particular has a lot of fragrance that just adds to the problem! Basically, if you do not have the desire to seek out well-formulated acne treatments on your own, ProActiv is a quick and easy solution. Otherwise, if you want to save some money, try creating your own skin care regimen by mixing and matching products from multiple brands! Checkout my videos on YouTube for information on other, very effective products! I've been using proactive for a few years. I find it to be a good beginner set. It taught me to get into the habit of taking care of my skin with 3 easy steps. Only problem I've found is it dries my lips really bad! Although you're supposed to avoid them, I found it hard for the product not to run onto my lips. With that being said, any tips on bringing moisture back to super dried out lips? I've tried many different products, but so many leave a glossy look.